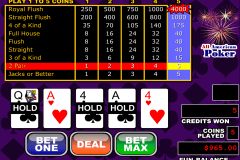 Video poker games are much more simple than the real poker, but sometimes it really gets way too simple. Today we are going to investigate the simplest video poker version our team has ever seen, which is the Poker Pursuit by Microgaming. Before we express our subjective opinion, let’s take a look at the technical side. 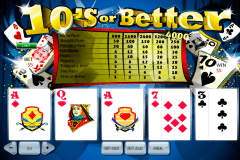 Basically, it is a free video poker played with a standard deck, including no wild cards and jokers. You can only adjust the bet right at the start of the game, then it is going to have a fixed value. You are given three cards at once and the other two cards from the same deck can be drawn by using two available options, which are the Call and the Raise. Your main task is to see if you get a possibly strong hand and Raise if the first statement is true. A Raise doubles up your bet and deals a card. Call is about just drawing a card. Whenever you have 5 cards, the game will automatically calculate your hand and the next thing you can do is to press Deal. This game is definitely not one of the best because it offers a wide range of choices so that you can’t develop a decent strategy, not even talking about complicated ones. The design is really simple and has nothing excessive. You can see the payout table above the gaming screen and use the Help button if needed. And that is all you get. 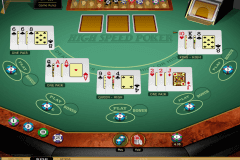 Poker Pursuit by Microgaming is a casino game for complete beginners. It requires no download and is worthy just in case you don’t want to think at all. Nevertheless, you can play this particular game to have a comparative experience.